I bet you’ve seen a ton of images like this one floating around Pinterest. It’s so cool how a trend can just take off. I made this little fruit buggy three years ago for a pregnant friend. I had just seen the idea trend on Facebook and thought I’d give it a try. This has got to be the cutest fruit tray I’ve ever made and the little star platter from the Dollar Tree really made it look even better! Just for fun, I searched this type of a tray on Pinterest while writing this post and there are now hundreds of these floating around. I’m still so astonished by how something can travel to so many people. They talk about the six degrees of separation. Does that mean that each person is within six degrees of someone who has seen this type of a platter online or made one? Maybe next time I’ll go for a bouquet of fruits. Wow you have one upped it on the fruit tray. Adorable and eatable idea. That is seriously so adorable! I wish I would have thought to make one of these, thank you for sharing! That is seriously too cute! I am not that creative. Oh my if I tried to make this I don’t even know what it would turn out like. Thanks for sharing. This is so cute!! I don’t think I could ever get my fruit tray to look like this, lol. 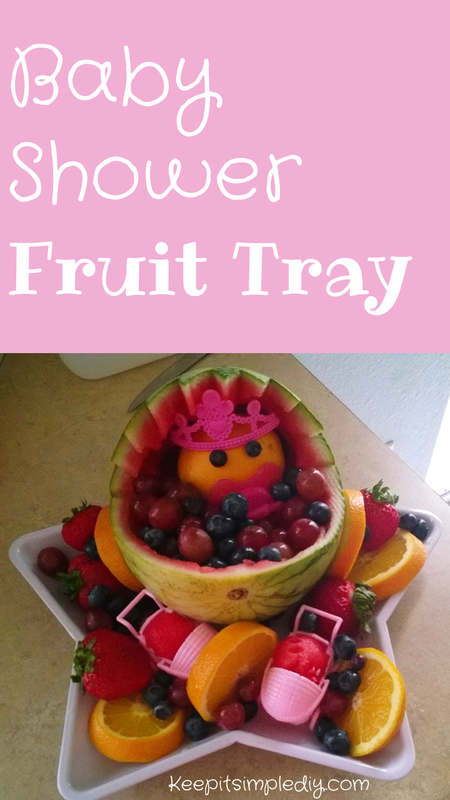 This is just super adorable and easy to do, thanks for the great idea, I am planning a shower for a friend now!